A few weeks ago, I received an email from Steve from Buffalo FX, an Englishman living in France, asking if I would review one of his hand built boutique Germanium Fuzz pedals. I thought why not but did not expect much of it, as I found that all the Fuzz pedals I had tried over the years lacked clarity and sounded like a buzz saw. Well, that all changed when I plugged Steve’s creation. I could not believe my ears, it is fat, has lots of clarity, cleans up well with the volume control and can sound like Hendrix or a lot more modern when boosted by another gain pedal. In one word, I was hooked! As always, I have recorded two videos (see the end of the post): one with my trusty Custom Shop Fender Strat and one with my Gibson SG 61 reissue. I will also kill two birds with one stone with this review and give a few Fuzz related tricks. 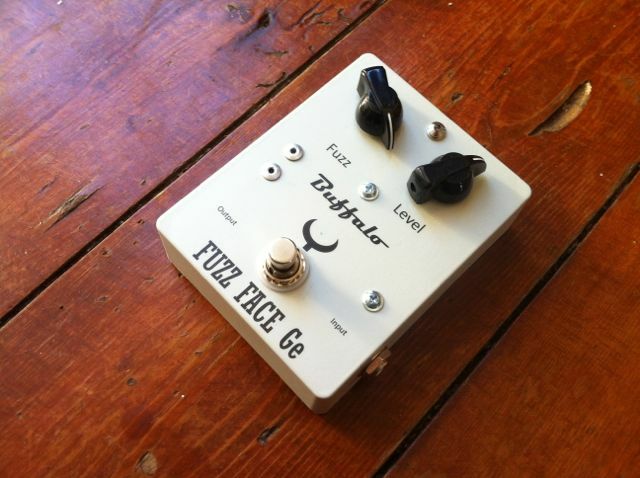 But first things first, let’s have a closer look at the Buffalo FX Germanium Fuzz. The Buffalo FX Germanium Fuzz is built to a very high standard. It is housed in a white metal case and sports a drive knob and a level knob. In the tradition of Fuzz pedals, there’s no EQ but it is not much of a problem. I have recorded the videos below using a fairly bright Fender amp and the pedal did not sound harsh at all. Note that Steve offers a 4 knob version with more tonal options. There are two welcome additions that traditional vintage Fuzz pedals usually lack: a super bright blue led and a Boss style 9v power input in case you don’t want to use a battery. Beware though, you cannot use the same power supply to power the Germanium Fuzz as well as other pedals due to some dark inverted polarity juju, not Steve’s fault, just the way Fuzz pedals are designed. This means you’ll need a dedicated power supply. Once again, you can also use a good old 9v battery. Talking of which, when I put a battery in, I could admire Steve’s handiwork: the inside it built to the same quality standard as the outside. A Fuzz pedal will sit at the beginning of your chain, usually before space effects such as delays and reverbs. It blends well with either a clean or a distorted amp and will play happily with other overdrive or distortion effects. The order varies here, I personally preferred putting my Tube Screamer overdrive before the Buffalo FX Germanium Fuzz to give it a kick but it can work well to put your overdrive pedal after the Fuzz. It’s hard to determine how two gain pedals will interact so experimenting is the key! Same goes for Fuzz and wah, I like my wah before my Fuzz, some people prefer it the other way. I have recorded my demo using a clean amp to demonstrate the intrinsic qualities of the pedal, but using a Fuzz to boost a good old cranked Marshall amp is obviously a classic recipe used by the likes of Hendrix or Eric Johnson. The first thing is about rolling off the volume to clean up the tone, something that a lot of early rock players had to do before the invention of multi channel amps. They basically had a fuzzed out saturated tone and got a clean tone back by rolling off their volume. The great thing about it is that the volume knob of your guitar will allow you to go from almost clean to crunch to all out Fuzzed out, very effective to vary your tone on the fly. This is especially efficient with a Stratocaster. The second trick is about using your tone control, something that is also forgotten in an era of multi-effects and modellers. Rolling off the tone gives a less agressive, fatter tone. Eric Clapton used this a lot in the Cream era for instance. It is very efficient with a good Fuzz pedal like the Bufflo FX Germanium Fuzz. And now, the same effect chain, with a Gibson SG 61 Reissue, note the difference with the Stratocaster video. The caracter of each guitar totally comes through the pedal. The model reviewed here is the “Two Button” Germanium Fuzz. Buffalo FX has a 4 button models, with more settings. There are also Silicon based Fuzz pedals in the line up (see this post about the difference between Silicon and Germanium Fuzz pedals). Don’t hesite to pay Buffalo FX a visit for more info about those models, and about ordering yours of course. As a follow up to two posts I wrote about the Reverb effect (see here and here), I thought that a demo of my good old Boss RV-3 was in order. At some stage, you could spot the Boss RV-3 in the pedalboards of acts such as Mike Eizinger (Incubus) or Johnny Greenwood (Radiohead). Made between 1994 and 2002, the RV-3 is quite unique as it combines a digital delay unit and a digital reverb unit. I have included the detailed specs at the end of this post for more information on the different modes. The Boss RV-3 is a product of the mid 90s. It doesn’t feature any analog delay or spring reverb simulations, this is a pure digital beast. Delays are crystal clear and reverbs are precise (some would say “metallic”). That said, I find that its unique capability (for a compact pedal) to combine delays and reverb provides big “studio quality” guitar tones which can be reminiscent of Jeff Beck’s studio sound on his recent albums. It can also go into total spacious ambient territory and can be used with two amps for a stereo setup as it features one input and two outputs. For all this, the RV-3 is quite underrated and is a great catch on the second hand market, watch out for one. The RV-5, which replaces the RV-3 in the Boss line up, features a spring reverb simulation on top of the digital kinds but does not have the delays of the RV-3. As such, I find hard to compare the two. The RV-3 has no less than 11 selectable modes. One knob selects the mode and the other 3 knobs have different functions depending on the chosen mode. 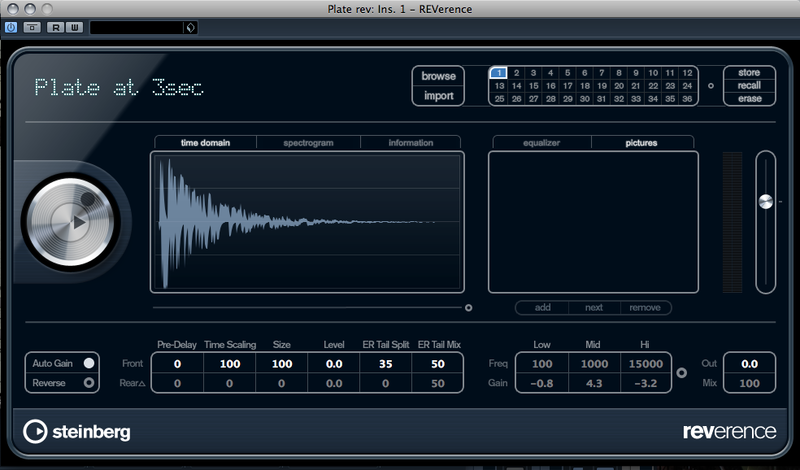 In reverb mode, they affect the parameters of the Reverb: tone, time and level. In delay and delay+reverb mode, they affect the feedback (number of repetitions), delay time (time between the repetitions) and the effect level. Note that in delay+reverb mode, you cannot choose the amount of delay and reverb separately, the unique level knob will allow you to blend more or less delay and reverb, put together. I have demonstrated all these modes in the video above, enjoy! As I have shown in the audio examples at the end of Part 1, a reverb unit can be used as an effect instead of a sound reinforcement tool. The main difference is that when you use the reverb as an effect, you usually want it to be heard as opposed to using it in a subtle fashion to add some depth to the sound. 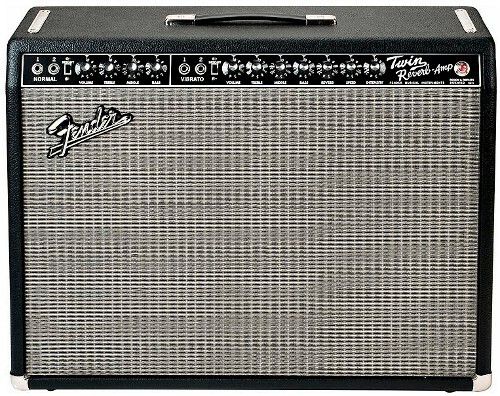 It is something that guitarists on the lookout for bigger tones have pioneered, thanks in large part to Fender whose amps often offered a built-in spring reverb. And let’s not forget their stand alone tube reverb unit which is an absolute classic. Surf music wouldn’t have been quite the same without these Fender clean guitar tones laden with spring reverb. But listen to Stevie Ray Vaughan’s albums and you will hear quite some spring reverb as well. It shows that electric blues is another style where amp reverb is a common staple. Past spring reverbs, a classic example of studio reverb used partly as a sound reinforcement tool and partly as an effect is Voodoo Chile Slight Return by Jimi Hendrix. The wah wah intro is completely magnified by an EMT plate reverb. The downside of reverb used as a live guitar effect is that it can be difficult to control in a venue, even a small one, because the venue itself will already have some natural reverb (see my previous post). It might make your tone really muddy which might be why, come the eighties and the advent of cheap digital delay pedals, most guitarists switched to using delays to widen their tone. It is not quite the same thing though and I can sense reverb pedals becoming popular. 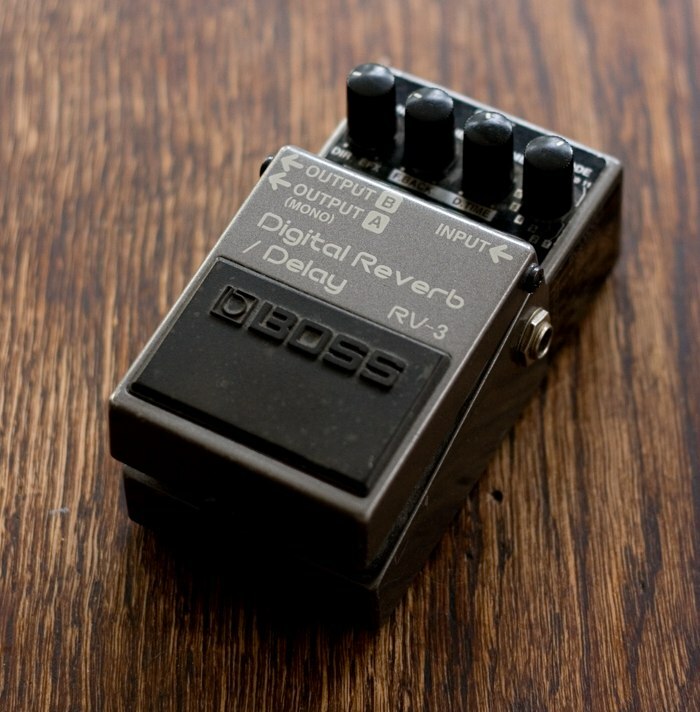 Boss RV-5: Boss was the first company to manage to squeeze a digital reverb in a compact pedal. I personally own an RV-3 which can generate Reverb AND delay effects (I will make a demo soon). The RV-3 has been replaced by the RV-5 which has dropped the delays but has gained a spring reverb simulation among other things. Electro Harmonix: the Holy Grail and its siblings have become immensely popular. They sport a luscious digital reverb as well as a spring reverb simulation. The T-REX Room-mate is digital I suppose but it features a tube for added warmth. I recently got a few comments asking why I use reverberation in post processing in some of my Youtube videos. In this series of posts, I would like to outline the two main uses of reverb for guitarists. In this first part, I will focus on the use of reverb in the studio and will explain why I sometimes add some light reverb to my videos. You will also find several sound examples. Part two will focus on the use of reverb as an effect. In an enclosed space, any sound will bounce off the walls, thus creating a king of muffled echo. An extreme case of reverberation is found in cathedrals or caves where any sound can be reverberating for seconds. But even in a small space, you will get some reverberation. Try clapping in your toilet or bathroom and you will probably hear it. In a nutshell, a reverberation unit (commonly known as reverb) is an effect device which aims at reproducing this phenomenon. Reverberation is also sometimes referred to as “ambiance”. Reverberation is almost as old as recording studios or radio stations. Sound producers and engineers had found out very quickly that recording any source (guitar, voice, etc.) using a microphone placed close to it lacked any sort of “ambiance” or “natural reverberation”, producing a quite unpleasant dry sound. To solve that problem, a number of artificial ways to produce reverb were invented. The most primitive was to use a big empty room with a speaker at one end and a microphone at the other end to record the effect. Later on, spring and plate reverberation units were invented. Eventually, digital technologies became affordable and reverb units capable of simulating pretty much any space are now available as software plugins, pedals, rack effects, etc. I invite you to read the wikipedia page dedicated to reverberation for more information. When I use a bit of reverb in my videos, this is not to “inflate” the tone, it is just because the microphone I use is close to my amp and misses out on the natural reverb of the room. Short of adding some artificial reverb, you can change the microphone placement and put it further away from the amp in order to get more of the ambiance of the room, but you might pick up undesirable sounds. It is a matter of experimenting and finding the right spot. The difference is very subtle but the reverb adds a “roundness” to the tone and makes it a little fuller without being over the top. This is the kind of reverb I often put on my youtube videos. When using reverb for sound reinforcement purposes, it is important to be subtle, the idea is not to hear the effect itself. Note how wide the tone becomes but also how different it is from the original. You can really hear the reverb, one could argue that in this case, the reverb is too pronounced and is rather used as an effect. Some of you might prefer a drier sound but more often than not, the point is that reverberation is a timeless and indispensable studio tool. We will explore in Part 2 of this series of posts the use of Reverb as an effect. This next post will feature a list of reverb units to add to your pedalboards, stay tuned!